Desineni Subbaram Naidu received B.E. degree in Electrical Engineering from Sri Venkateswara University, Tirupati, Andhra Pradesh, India, M.Tech. degree in Electrical Engineering (Control Systems Engineering) and Ph.D. degree (1979) in Electrical Engineering (Control Systems Engineering), from Indian Institute of Technology (IIT), Kharagpur, India. Since August 2014, Professor Naidu is the Minnesota Power Jack F. Rowe Endowed Chair and Professor of Electrical Engineering, at University of Minnesota Duluth, Minnesota, USA. In March 2015, Professor Naidu was awarded Professor-Emeritus status with Idaho State University for "years of service to Idaho State University Community". Nominated for the election to become a Member of the National Academy of Engineering (NAE) of the United States National Academies, Washington, DC, March 2018. (Results are announced in February 2019). 1) Professor Naidu was elected in 1995 as a Fellow (now Life Fellow)of the Institute of Electrical and Electronics Engineers (IEEE), "the world's largest professional association for the advancement of technology, more than 426,000 members in more than 160 countries, more than 50 percent of whom are from outside the United States", USA (and an IEEE member since 1978-), The Fellow is "the highest grade of membership in the IEEE" and "one of the Institute's most prestigious honors'' conferred on ``less than one in a thousand members of the IEEE''. The citation of the IEEE Fellow is "for contributions to the theory of singular perturbations in discrete-time control systems and for development of control strategies for aero-assisted orbital transfer" for the research work done at Indian Institute of Technology (IIT), Kharagpur and the Guidance and Control Division, NASA Langley Research Center, Hampton, VA, USA. 2) During January 1985 to December 1986, Professor Naidu was the recipient of the prestigious Senior Research Associateship Award from National Research Council (NRC) of the National Academies (of Sciences, Engineering, and Medicine) , Washington, DC, to conduct independent research with Guidance and Control Division at NASA Langley Research Center, Hampton, Virginia, USA. These awards are made by the NRC based on an "international competition to outstanding senior scientists and engineers with established records of research for tenure as guest investigators on problems of their own choice at the United States Federal Laboratories and Centers". 3) During 1998-99, Professor Naidu was selected for the second time for the prestigious Senior Research Associateship Award by the National Research Council (NRC) of the National Academies (of Sciences, Engineering and Medicine) (NAS), Washington, DC, to conduct independent research at the Center of Excellence in Advanced Flight Control Research, Unites States Air Force Research Laboratory (AFRL) at Wright-Patterson Air Force Base (WPAFB), Ohio, USA. These awarders, "join the ranks of distinguished scholars who have been chosen to participate in the Research Associateship Program to provide postdoctoral scientists and engineers of unusual promise and ability opportunities for research". 4) Professor Naidu's research and development work on 3-D Printed Robotic/Prosthetic Hand was selected for Greater MN Billboard Campaign by University of Minnesota Duluth (UMD), Duluth, Minnesota, USA. He was interviewed by the KBJR 6 of NBC Television and KDLH 3 of CBS Television and Duluth News Tribune. Professor Naidu's research on commercialization of Prosthetic Hand appeared in Minnesota Business Magazine (MBM): Special Issue: THE MONEY GAME, cover page and pages 10-13, July 2016. Delivered a TED Talk entitled, 3-D Printed Prosthetic Hand for the World for TEDxMinneapolis, Minneapolis, MN, USA at Tedd Mann Concert Hall, “a world-class concert auditorium”, located on West Campus of University of Minnesota, Minneapolis, MN, USA, during the annual IN SIGHT event scheduled from 4:00 PM to 11:00 PM on Friday, August 12, 2016. ``TED is a nonprofit devoted to spreading ideas, usually in the form of short, powerful talks (18 minutes or less). TED began in 1984 as a conference where Technology, Entertainment and Design (TED) converged, and today covers almost all topics — from science to business to global issues". 5) was a selected recipient of the Idaho State University (ISU) Outstanding Researcher Award during 1993-'94 and 1994-95 (ONE of the FIVE) and selected recipient of ISU highest research recognition Distinguished Researcher Award during 1994-'95 (number ONE among the FIVE Outstanding Researchers). 6) Was selected as Minnesota Power Jack F. Rowe Endowed Chair at University of Minnesota Duluth (UMD) in August 2015 based on a world-wide competitive search. Minnesota Power, Duluth, Minnesota established the first endowed chair at the University of Minnesota Duluth, the Minnesota Power Jack F. Rowe Chair of Engineering in honor of Jack F. Rowe, former Minnesota Power Chairman, President, and Chief Executive Officer. 7) was selected as Satish Dhawan Endowed Visiting Professor, Department of Aerospace Engineering (AE), Indian Institute of Science (IISc), Bengaluru, Karnataka, India, January - May 2017. Indian Institute of Science (IISc), Bangalore, also called Tata Institute, founded in 1909 by the joint efforts of famous industrialist J. N. Tata and the Government of India, is "the premier institute for advanced scientific and technological research and education in India". Department of Aerospace Engineering is "established in 1942, and the biggest aerospace department in the country". IISc has been ranked eighth in "the Best Small Universities in the World 2017", according to Times Higher Education (THE), 07 March 2017. Professor Satish Dhawan had BS degrees in Physics and Mathematics, and Mechanical Engineering and MS in English Literature from University of the Punjab in Lahore, India (now Pakistan), MS degree in Aerospace Engineering from University of Minnesota, Minneapolis, USA and PhD degrees in Mathematics and Aerospace Engineering from California Institute of Technology, Pasadena, CA, USA. Professor Dhawan was a faculty member and then director of Indian Institute of Science (IISc), Bengluru, India and chairman, Indian Space Research Organization (ISRO). 8) Was an elected Fellow of the World Innovation Foundation, Huddersfield, United Kingdom. The motto of WIF is "harnessing leading edge global innovative thought for the good of all human kind in the 21st century and beyond". 9) Was an elected Associate Fellow of American Institute of Aeronautics and Astronautics (AIAA), USA. 10) Received the Distinguished Electrical Engineer award from IEEE Idaho Section, Pocatello, Idaho. 12) Was awarded Merit-based Scholarships throughout his academic studies: graduate - MTech/MS and undergraduate- BE/BS programs and awarded certificates for obtaining the highest grade point average (GPA) as Valedictorian during his pre-university and high-school programs. Until December 1984, Professor Naidu held various positions with the Department of Electrical Engineering, IIT Kharagpur. During the same period, he conducted and supervised research, and established a research group, in the field of singular perturbations in control systems. During January 1985 to December 1986, Professor Naidu, as Senior Research Associate of the US National Research Council, conducted independent research with Guidance and Control Division at NASA Langley Research Center, Hampton, Virginia, USA. At NASA Langley, Dr. Naidu developed singular perturbation methodology for digital flight control systems and guidance and control strategies for aeroassisted orbital transfer. From January 1987 to July 1990, he was an Associate Research Professor in the Department of Electrical and Computer Engineering, Old Dominion University, Norfolk, Virginia, and continued to conduct full-time research in Spacecraft Control Branch, NASA Langley on guidance and control strategies for aeroassisted orbital transfer vehicles. 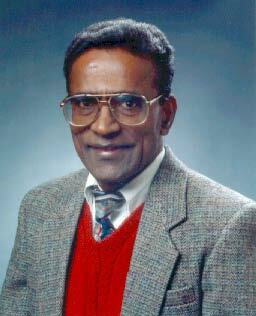 During July 1990- June 2014, Professor Naidu was with Idaho State University (ISU) as Professor (tenured effective July 1991), Co-Director (June 1993 - July 1998) and Director (1998-2014), the Measurement and Control Engineering Research Center, Coordinator/Chair (1997-2005), Electrical Engineering, Interim Associate Dean for Graduate Studies (August 98 - July 1999), Associate Dean of Graduate Studies (August 1999 - June 2006), Associate Dean (June 2006 - June 2010), and Founding Director (2010 - 2013) of the School of Engineering, Idaho State University, Pocatello, Idaho. During 1998-99, Professor Naidu, as Senior Research Associate of the US National Research Council (NRC) conducted independent research on guidance and control strategies for hypersonic vehicles at the Center of Excellence in Advanced Flight Control Research, Unites States Air Force Research Laboratory (AFRL) at Wright-Patterson Air Force Base (WPAFB), Ohio, USA. During summer of 2004, Professor Naidu was awarded a fellowship by the Norwegian Research Council (NRC) at the Center of Excellence for Ships and Ocean Structures of Norwegian University of Science and Technology (NTNU), Trondheim, Norway and conducted research on time-scale based optimal control strategies for robotic underwater exploration. During June 13 - August 12, 2005, Professor Naidu had an opportunity to work as Academic Guest at Measurement and Control Laboratory (IMRT:Institut für Mess- und Regeltechnik) at Swiss Federal Institute of Technology (ETH: Eidgenössische Technische Hochschule), Zurich, Switzerland. At IMRT/ETH, Professor Naidu offered, by invitation, a short course on Selected Topics in Nonlinear Control Systems to doctoral students. During May 2007, Professor Naidu visited by invitation, the Dept. of Electrical Engineering at Nantong University , Nantong, Jiangsu, China and conducted a weeklong graduate level short course on Optimal Control Systems. As part of sabbatical during Spring 2008, Professor Naidu conducted research on Control Applications to Biomedical Engineering with particular reference to prosthetics field at the Department of Electrical Engineering, the University of Western Australia , Crawley, Perth, Australia, and on Applications of Linear Programming Approach to Nonlinear Optimal Control Problems at the Center for Industrial and Applied Mathematics (CIAM) , Institute of Sustainable Systems and Technologies (ISST), Division of Information Technology (IT), Engineering and Environment, University of South Australia , Adelaide, Australia. During December 2009, he visited (by invitation) the Center for Applied and Interdisciplinary Mathematics, Department of Mathematics, East China Normal University (ECNU), Shanghai, China, to conduct collaborative research on singular perturbations and time scales (SPaTS). During December 10-31, 2011, Dr. Naidu visited (by invitation) the Center for Applied and Interdisciplinary Mathematics, Department of Mathematics, East China Normal University (ECNU) , Shanghai, China, and besides working on time scales for networked control systems, conducted a short graduate-level course on Optimal Control Systems, based on his own book, Optimal Control Systems, CRC Press, 2003. He also made presentations on ``Smart Prosthetic Hand Technology at Idaho State University", at Nantong University, Nantong, China, on December 17, 2011, and at the Institute of Systems Science , Academy of Mathematics and Systems Science , Chinese Academy of Sciences (CAS) , December 26, 2011 and on ``Singular Perturbations and Time Scales (SPaTS) in Control Theory and Applications", at the Department of Mathematics, Shanghai Jiao-Tong University (SJTU), Shanghai, China, December 22, 2011. Professor Naidu made an invited presentation on "Smart Prosthetic Hand Technology at Idaho State University", at Control Engineering Department, Istanbul Technical University (ITU), Istanbul, Turkey, on August 24, 2012. ITU one of the top technical universities in the world, was established in 1773 (compared to MIT established in 1861 in USA. By invitation, Professor Naidu taught a graduate level, one-week, short course on selected topics in Optimal Control Systems based his (Naidu's) own book: Optimal Control Systems, (CRC Press (USA)/Taylor & Francis (UK), 2003, at the Department of Instrumentation and Control Engineering (established in the year 1965), College of Engineering (established in 1854), Pune (COEP), Maharashtra, India, during January 05 to January 09, 2015. Professor Naidu worked as Satish Dhawan Endowed Visiting Professor, Department of Aerospace Engineering (AE), Indian Institute of Science (IISc), Bengaluru, Karnataka, India, January 2 to May 20 2017, on single-semester leave (SSL) from University of Minnesota Duluth (UMD). Professor Naidu's primary areas of teaching and research include Electrical Engineering, Power and Energy, Biomedical Engineering, Control Systems, Neural Networks, Measurements and Instrumentation, Mechatronics, Guidance and Control in Aerospace Systems, Trajectory Optimization, Aerobraking, Orbital Mechanics, Singular Perturbations and Time Scales (SPaTS) in Control Theory and Applications, Optimal Control Systems, Nonlinear Control Systems, Intelligent Control Systems, Digital Control Systems, Geometric Control Theory and Applications and Modeling, Sensing and Control of Gas Metal Arc Welding (GMAW). Professor Naidu has secured (as PI/co-PI) over $4.4M external funding, supervised 10 post-doctoral fellows, 15 PhDs and a number of MS students. 1) An interdisciplinary research project in Biomedical Sciences and Engineering titled Smart Prosthetic Hand Technology was executed during 2006-13 at the Measurement and Control Engineering Research Center (MCERC), Idaho State University (ISU), funded ($2.243M) and managed by Telemedicine & Advanced Technology Research Center (TATRC), United States Army Medical Research and Material Command (USAMRMC), Department of Defense (DoD). This truly interdisciplinary research project, exemplifying The Third Revolution: The Convergence of Life Sciences, Physical Sciences, and Engineering (The First Revolution: Molecular and Cellular Biology and The Second Revolution: Genomics - MIT Report 2011 and NRC Report 2014), was awarded under the "Telemedicine and Advanced Medical Technology Program (TATP) with the scope to identify, explore, and demonstrate key technologies and biomedical principles required to overcome technology barriers that are both medically and militarily unique". The research team consisted of seven faculty investigators (PI and Co-PIs) and several graduate (MS & PhD) and undergraduate (BS) students from Electrical, Mechanical and Civil and Environmental Engineering disciplines, Computer Science, Biomedical Sciences, and Physical and Occupational Therapy at ISU. 2) An interdisciplinary research project in Physical Sciences and Engineering titled, Advanced Welding Control Technology was executed during 1995-97 at the Measurement and Control Engineering Research Center (MCERC), Idaho State University (ISU) with funding ($615K) under the MIT University Research Consortium (URC) (of 24 universities in 17 states) for the Lockheed Martin Idaho Technologies Company, the management and operations contractor for the Idaho National Engineering Laboratory (INEL) of the US Dept. of Energy (DoE), the consortium consisted of 23 universities in 17 states. The research team consisted of faculty from engineering, technology and physics, post-doctoral fellows and graduate students. The purpose of the URC is to "help INEL in its reorientation to new goals set by DOE for its national laboratories. Those goals include developing new technologies useful in our competitive economy or in meeting national needs such as environmental management". IV) D.S. 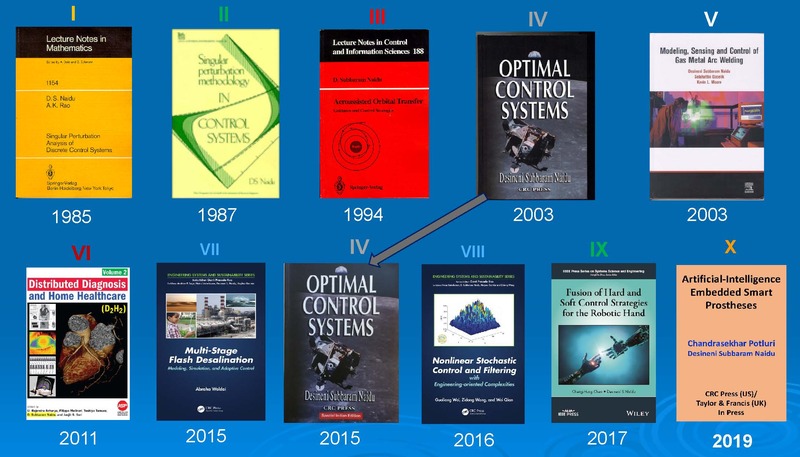 Naidu, Graduate Senior Level Textbook, Optimal Control Systems along with Solutions Manual, CRC Press (USA), of Taylor & Francis Group, Abingdon, UK, , 2003; Special International/Indian Edition, 2015; This book, written ``keeping the student in mind", has been adapted by over 120 universities in USA (40) and the rest of the world (80). VI) J.R. Acharya, F. Molinari, T. Tamura, D.S. Naidu, and J.S. Suri, Editors, Advanced Study/Research/Reference Book Distributed Diagnosis and Home Healthcare (D2H2): Volume 2, American Scientific Publishers, Valencia, CA, USA, 2011 with 2 contributed chapters by D.S. Naidu, C.-H. Chen and V. Nandikolla. VII) Ganti Prasada Rao: Series Editor, Andrew P. Sage, Heinz Unbehauen, D.S. Naidu and Hugues Garnier: Series Co-Editors, an edited book, Multi-Stage Flash Desalination: Modeling, Simulation and Adaptive Control by Abraha Woldai, Engineering Systems and Sustainability Series,CRC Press, A Taylor & Francis Group, London, UK, July 2015. VIII) Ganti Prasada Rao: Series Editor, Heinz Unbehauen, D.S. Naidu, Hugues Garnier and and Zidong Wang: Series Co-Editors, an edited book, Nonlinear Stochastic Control and Filtering with Engineering-oriented Complexities by Guoliang Wei, Zidong Wang, Wei Qian , Engineering Systems and Sustainability Series,CRC Press, A Taylor & Francis Group, London, UK, July 2016. X) C. Potluri and D.S. Naidu, Artificial-Intelligence (AI) Inspired Signal Processing for Prosthesis, Advanced Study/Research/Reference Book, Accepted for publication (in September 2018) by CRC Press (USA) of Taylor & Francis Group (UK), Expected to be out in June 2019. Professor Naidu has been on the Editorial Boards of the Open Journal of Optimization (OJOp) , Scientific Research Publishing, Irvine, CA, USA, December, 2012 to present; ISRN Biomedical Engineering Journal , Hindawi Publishing Corporation, New York, NY, USA, 2010 - present; IEEE Transaction on Automatic Control , New York, USA (1992-1999); the International Journal of Robust and Nonlinear Control , John Wiley & Sons, New York, NY, USA (1996-2009); Optimal Control: Applications and Methods , John Wiley & Sons, New York, NY, USA (2009 -present); Mechatronics: The Science of Intelligent Machines, An International Journal , Oxford, UK (1992-2010); International Journal of Information Sciences \& Systems Sciences (IJISS)}, Alberta, Canada (2009-present); Member of General Committee of The International Congress for Global Science and Technology (ICGSC), Tuebingin, Germany (2004-present), and a member of the , ACSE Steering Committee on International Journal on Automatic Control and Systems Engineering (ACSE), (2004 -present), Journal of Advanced Research in Dynamical and Control Systems (JARDCS), published by the Institute of Advanced Scientific Research(IASR), a Scientific, Academic and Non-profit Organization based on Irvine, CA, U.S.A, (2009 - present) and International Journal of Control-Theory and Advanced Technology (C-TAT) , Tokyo, Japan (1991-1995). Professor Naidu was a Member of the American Society of Engineering Education (ASEE), USA (1991-2014), a Member of Sigma Xi, The Scientific Research Honor Society for Science and Engineering, Research Triangle Park, NC, USA (2000-2008); a Member of the Society for Industrial and Applied Mathematics (SIAM), Philadelphia, PA, USA (1999 - 2003); a Member of The National Space Society, USA (1992-2003); a Member, National Air & Space Museum, Smithsonian Institution, Washington, DC, USA (1992-2003); and Secretary/Treasurer, IEEE Idaho Section, Pocatello, Idaho (1993-1997). Professor Naidu was a registered Professional Engineer (PE) with Idaho Professional Engineers and Land Surveyors (IPELS) June 1994 - June 2014 and a participant in the Committee on Examinations for Practice of Engineering (PE) workshop for Electrical Engineering for National Council of Examiners for Engineering and Surveying (NCEES), Clemson, SC, (during 2001 - 2007). Professor Naidu's biography is listed in several biographical resources including (multiple-year) in Who's Who Among America's Teachers, Fifth Edition, published by Educational Communications, Inc., Lake Forest, IL, the Silver Anniversary 25th Edition of WHO'S WHO IN THE WEST , published by Marquis Who's Who, the primary source of information on outstanding men and women in the region, and the seventh edition of Who's Who in Technology (WWT) , a biographical reference source published by Gale Research. Professor Naidu is a citizen of the United States of America.